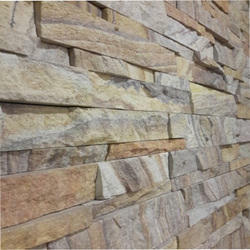 Prominent & Leading Wholesaler from Bengaluru, we offer natural stone cladding. Dimension Upto 6" x 24"
With enriched market knowledge and experience, we are delivering an excellent series of Natural Stone Cladding. The offered product is widely preferred by architects for their pastel colour scale, natural wood designs, and metallic look finish. As per the ever-evolving needs of our clients, we provide this clad to our clients in different designs and shapes.